As we near August, we're finally seeing some relief from the tight capacity that defined most of May and June. 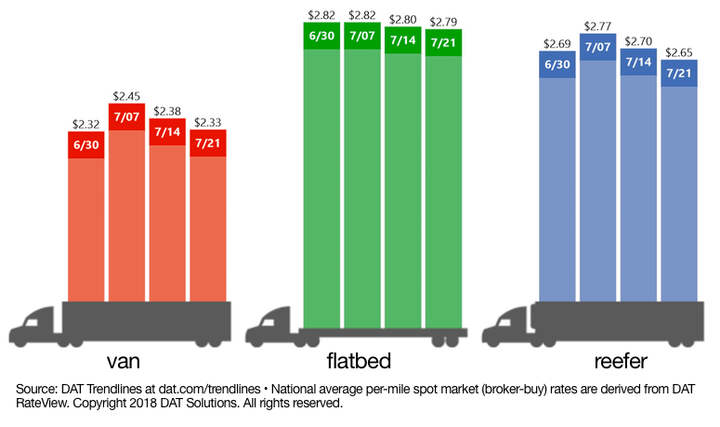 Dry van, reefer and flatbed rates have dipped slightly from their record highs as a result of less loads flooding the market and more trucks becoming available. We expect the market to remain steady until the end of next month when the amount of imports rise, big box store volume increases, and shippers begin stocking up in preparation for the holidays. Source: KeyBanc Capital Markets, inc.